A volcano on the Alaska Peninsula erupted with little advanced warning over the weekend, spewing an ash cloud up to 20,000 feet (6,096 meters) high that prompted aviation warnings across the region, scientists said on Monday. Mount Pavlof, one of the most active volcanoes on the peninsula, began erupting shortly after 4:00 p.m. Alaska Daylight Time on Sunday, said Jessica Larsen, coordinating scientist with the University of Alaska Geophysical Institute. “Pavlof is known to us for having a pretty quick onset to eruptions, it doesn’t always give us long precursory signals,” Larsen said. “If you look at some of the seismic data that we have, the intensity really ramped up pretty fast. It was quite abrupt,” she said. 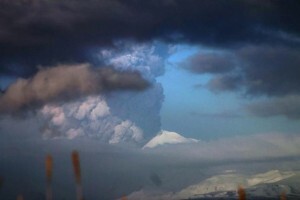 Photos on the Alaska Volcano Observatory website showed the plume towering over the icy slopes of Mount Pavlof and drifting to the northwest. The Federal Aviation Administration issued a “red” aviation alert in response to the 20,000-foot-high ash cloud, which required that flights to be re-routed. The alert could affect local and regional air traffic, as well polar routes and cargo flights from Anchorage. Larsen said the eruption did not pose any immediate danger to nearby communities on the peninsula, which were monitoring the ash fall. The closest residential area is Cold Bay, located 37 miles (60 km) southwest of Pavlof. There have been more than 40 eruptions from Pavlof, including between May and November of 2014, when ash plumes also triggered aviation warnings. Such events can last weeks or months. “This 20,000-foot ash cloud is not unusual for Pavlof at all,” Larsen said, adding that the highest recorded plume from the volcano was 49,000 feet.